2005: Norwich man John Wright has hit the national headlines with his Stop A Copper Society which has taken on a new lease of life 25 years after he first founded it. 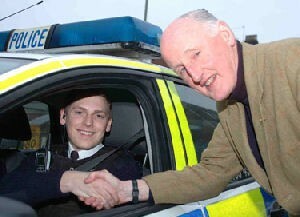 John (pictured right saying thank you to a Police officer in Norwich), a lay reader at Stoke Holy Cross church and an international director of the Full Gospel Business Men's Fellowship International, has found a renewed interest in the Society which encourages people to be nice to traffic wardens and Policemen. Following a letter in the Daily Telegraph, local and national radio and television have taken up the cause of saying thank you to people without whom we would have chaos, said John. “In December a leader in the Telegraph commented on the amazing grace given to Christians like Abigail Witchell to forgive those who have harmed them or who have killed loved ones,” explained John. “The leader commented that we should try to be nice to people we love to hate like traffic wardens. “So I wrote to say this was nothing new as the Stoppa Coppa Society, which I founded in 1980, had been doing just this for 25 years. Below, John explains the reasons behind the Society and how to join it. How to join the Stoppa Coppa Society. Why should we all do this? If you call someone a rude name it is a self-fulfilling prophecy. If someone is called a pig that is how they will behave. We reap what we sow! Apart from blessing others you will be blessed yourself! We can all say ‘well done’ to anybody who needs encouragement. Bus conductors, doctors, sales assistants, lorry drivers. We can also write to the Boss and give a good report. To read more of John Wright’s own story click here. John has been and is a real Blessing to everyone that he meets with. The people that have the privilage to meet with John actually feel the presence of God around him. All of John's family and his supporters are what makes life worth living. They are all a living proof of the Grace of God. May Every Blessing Be Upon Them All.